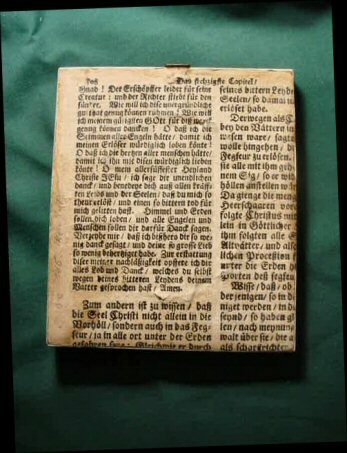 DESCRIPTION: This is a Raumbilderbuch or 3-dimensional book by the Raumbild Verlag Otto Shonstein in Munich. 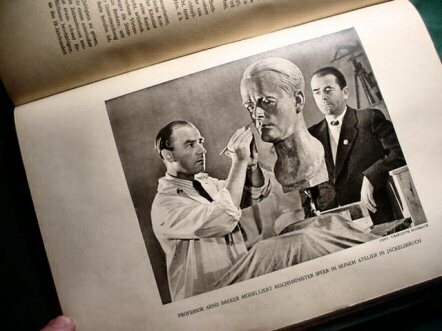 The foreword is by Reichsminister Albert Speer. 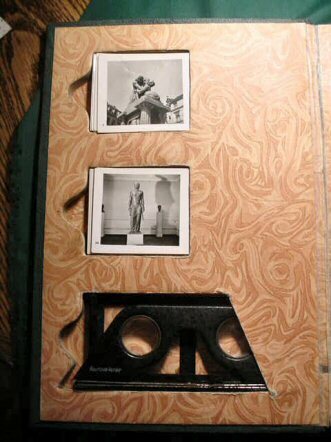 It has 135 3-D pictures (stereographs) and many regular pages of great, regular pictures. There are sculptural studies by Josef Thorak, Arno Breker, Adolf Wamper, Georg Kolbe, Karl Albiker, and many of the other greats of Third Riech art. The massive eagles of Kurt Schmid Ehmen, the superb outdoor art of Josef Wackerie, the fabulous nudes of Fritz Klimch, and the sculptured busts of Ferdinand Liebermann are wonderfully presented. There are 120 pages of text and pictures and then the absolutely fantastic stereographs. 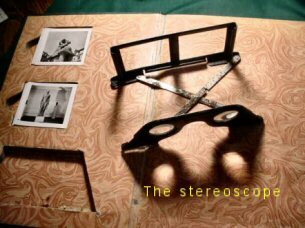 The 3-D viewer (stereoscope) is enclosed in the front cover. If you have never seen or used one of these Raumbilders, you would be in for a great surprise. 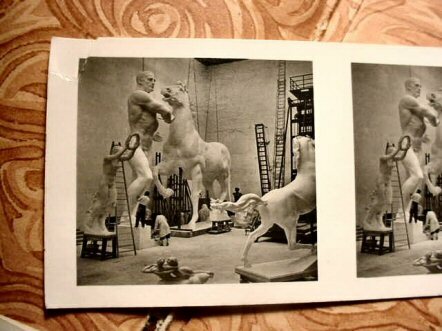 When these pictures are viewed through the stereoscope you will positively believe you are right there in the studios of these immortal artists. 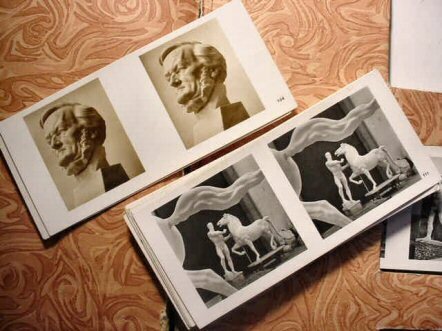 Not enough can be said about the fantastic realism perceived through these magic lenses. 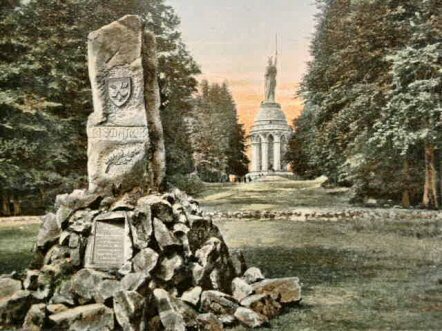 Sit down, put on a CD of music of Richard Wagner, Gotterdammerung, or the Siegfried “Idyl” and be transformed to the Reich and be completely bowled over by the stark magnificence of the wonderful, realistic art that meets your gaze. This is not only one of the most important of the series of these books, but definitely the most beautiful. The picture cards are all in very good shape with a ding here and there, but most important, they are complete. 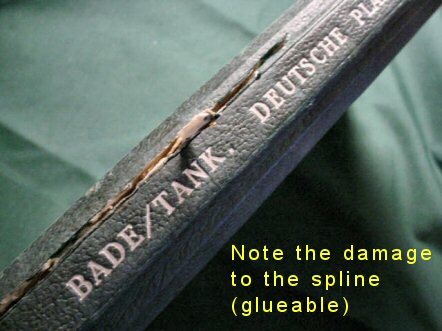 The spine of the book is a bit loose because of the very heavy covers being opened constantly since 1942, or so. In general, the volume is considered fine. 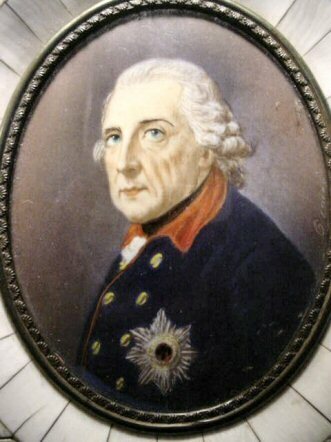 DESCRIPTION: Here is a fine little portrait of the immortal Prussian King and Father of Prussian militarism. It looks to be hand painted from the original by Anton Graff. 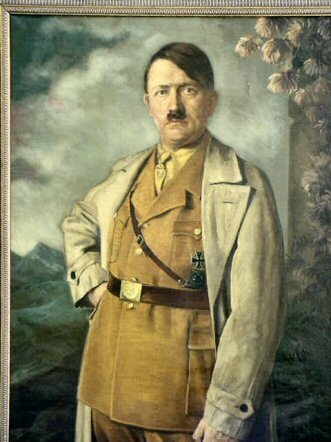 This was the favorite study of Adolf Hitler, who always had it in his office and in the final days he gave it to General Hans Baur in the traditional manner. The portrait is painted on an enamel planchet and the frame is constructed with pieces of bone. This is very nice piece of 1920-1930’s art. PRICE: $850.00. Price reduced by the consigner to $650.00. 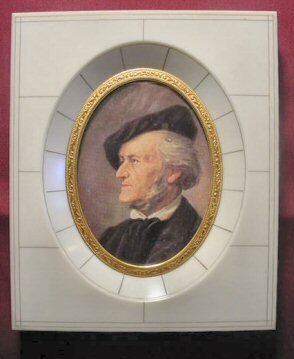 DESCRIPTION: This is a rather fine miniature portrait of the world’s greatest composer. 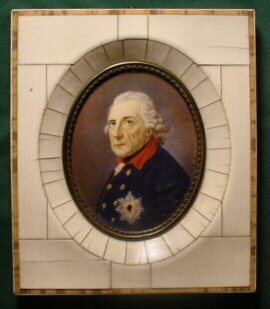 Earlier portraits were framed in ivory. 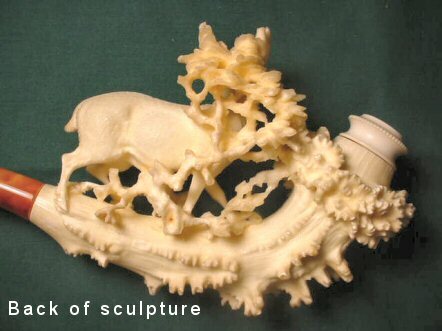 This much later one is in the traditional style, but instead of ivory, it is done in celluloid. 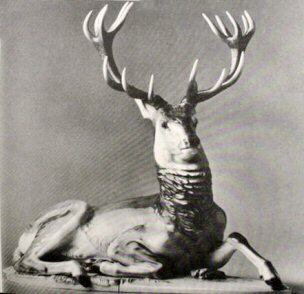 Many of these were sold to the faithful in Bayreuth in the 1930’s. We purchased this piece at a military show in Stuttgart this past year and we do not know how old it is. The image is not a painting; it is a print. It has nice color, but definitely a print actually cut from a color postcard. 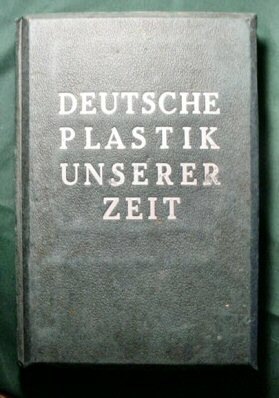 The item still looks very good on the Germanophile’s desk or shelf. 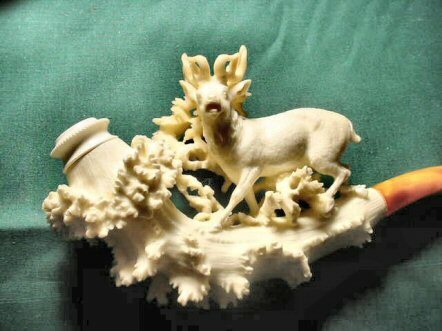 DESCRIPTION: This is one of the most elegantly carved meerschaum pipes that we ever had the pleasure to offer on Germania’s pages. 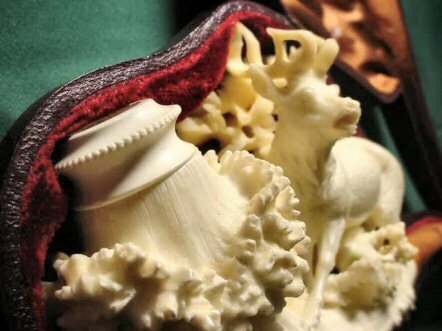 It is absolutely incredible to even image that an artist could ever manage to produce this with carving tools. 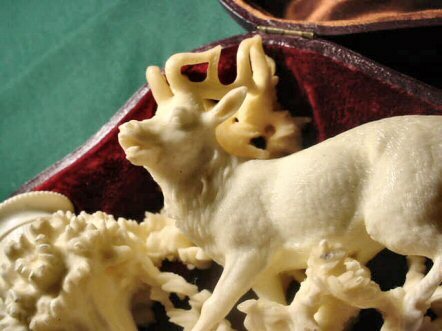 The intricacy is phenomenal and the condition is perfect except for a tiny antler tip that one would practically need a magnifying glass to examine it. The stem is of amber and the case, in excellent-plus condition, is lined in rich, red velvet in the bottom and a fine silk lining in the upper portion. 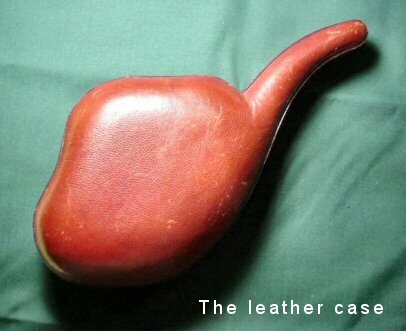 The case is made up from rich reddish-brown cowhide. From the tip of the stem to the bowl of the pipe it measures 9 inches. 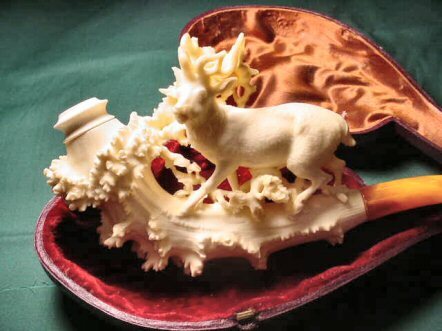 From the top of the stag’s antlers to the bottom of the tree trunk it measures 4 inches. 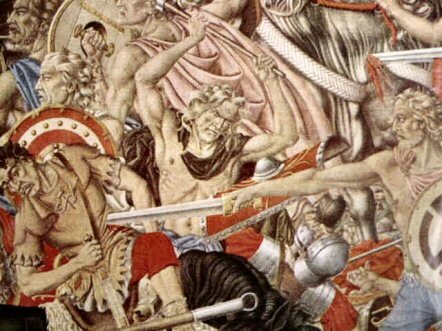 All the muscle, all the hairlines of the animal give a lifelike depiction that is so much more difficult to portray in carving than it is, for instance, in a painting. 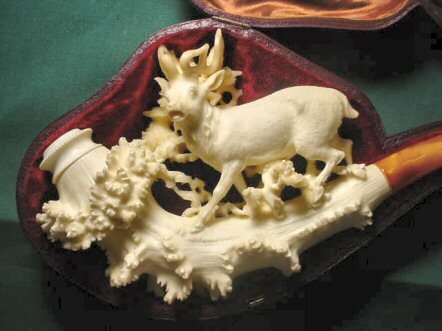 This is truly a masterpiece in meerschaum art. 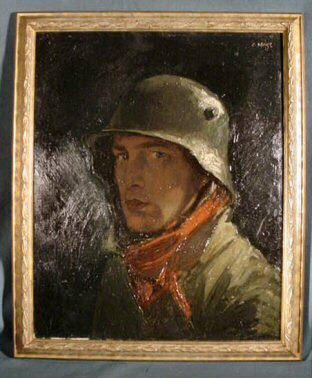 DESCRIPTION: This practically is a masterpiece that was painted in oil in 1941. The colors and artist’s style is magnificent. Here is something of an official state portrait obviously by the hand of a very professional artist, possibly of some renown. 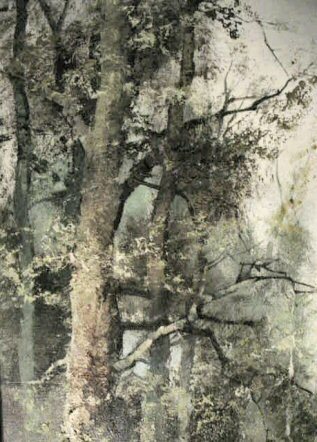 All we could find was a listing in Davenport’s Art Reference Guide referring to a Heinrich Fischer, 19th Century, German landscapes, figures. 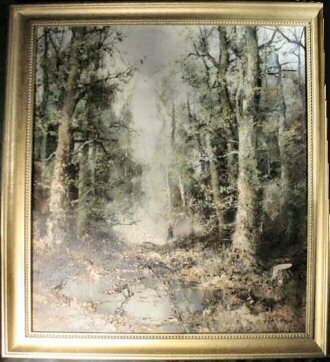 If he painted in the 1890’s, for instance in 1899, he may have painted this prestigious subject some 40 years later, probably when he was in his 60’s or even in his 80’s. We feel strongly that “H. 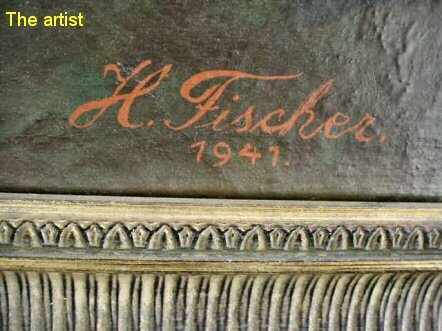 Fischer” that is signed on this work of art will be none other than this artist. In any case, the fact remains that this is no amateur rendering. 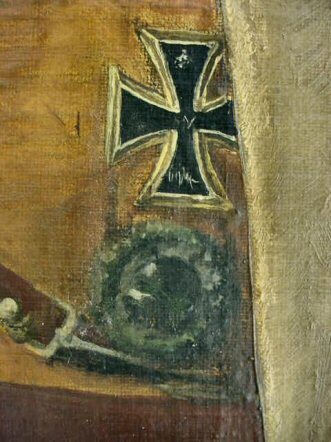 It depicts the German Führer in his early brown uniform with eagle stickpin, Iron Cross 1st Class, and Wound Badge. The usage of detailed intricate touches on belt buckle, belt fittings, etc., show mastery of the brush. 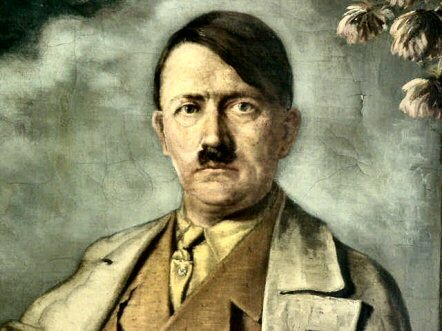 The face of the Führer reflects power and intellect. 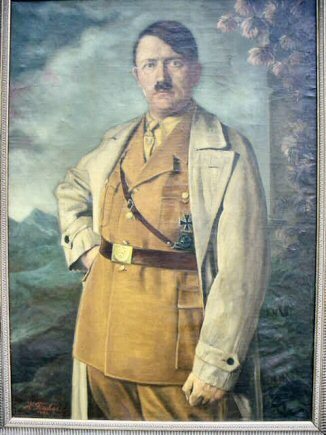 The usage of foliage down the right side reflects the Hitlarian love of nature. The mountains in the background, of course, represent the Bavarian Alps that he loved so much. 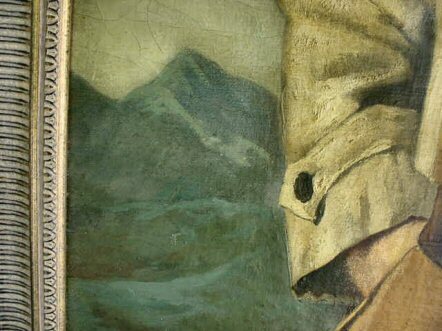 The well-used greatcoat that seemed to be constantly worn is depicted with realistic wrinkles. 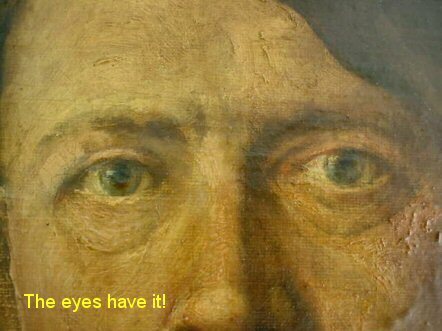 But most of all, immediately noticed are the eyes. Those eyes that so many associates and visitors insisted were hypnotic. We have seen other artists’ renderings of this astounding and phenomenal man, but very few have ever quite captured the stare, the visage, the magnetism of those eyes. 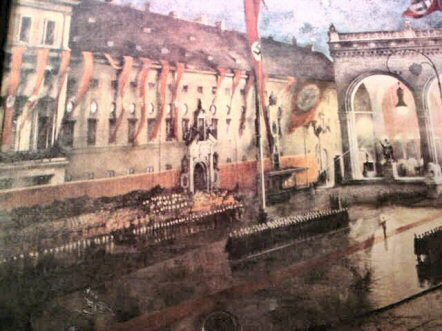 The painting is possibly one of the finest ever produced in the Third Reich of the Chancellor and Führer. We mentioned the wrinkles on the overcoat. Now look at a simple small detail. I direct you to the belt. Now look at the creases the belt makes in the tunic because of its tightening. There are few artists that would even take notice of this let alone portray it so prodigiously well. 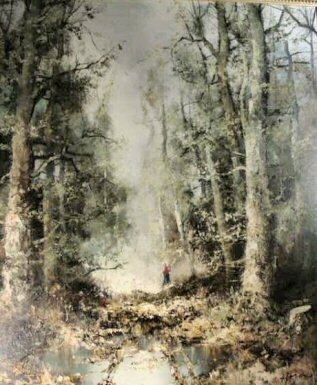 Here is a painting that may never be called a masterpiece, but none-the-less it is definitely important and could easily be said to be excellent plus-plus. 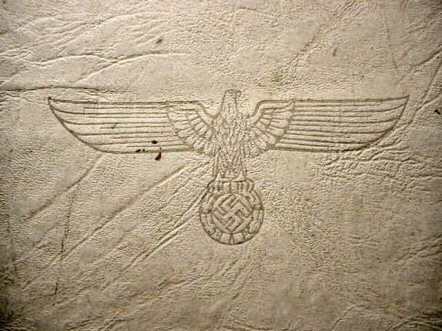 It probably hung in some important NSDAP building. 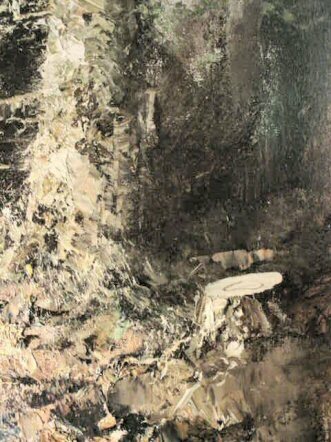 The condition is good for a painting that came from war-torn Europe, while escaping defacement and defilement by the conquering allied heroes. 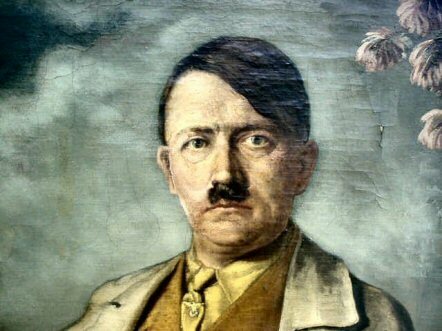 So many Hitler portraits ended up slashed with bayonets or shot up with .45’s. It is in a great portrait size. 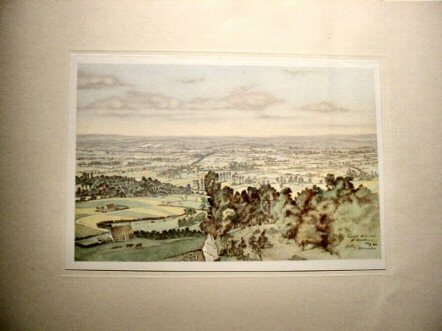 The picture in its frame measures 46 inches x 35 inches. It has been restretched at some point and remounted. 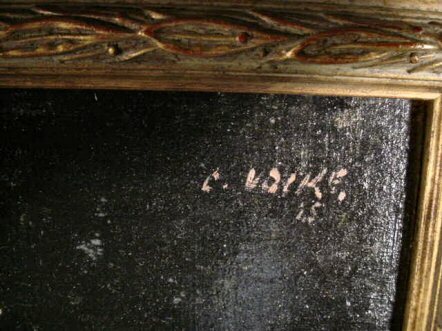 The frame possibly is not the original because usually paintings like this were taken from their original frames, rolled up, and secretly stored away. 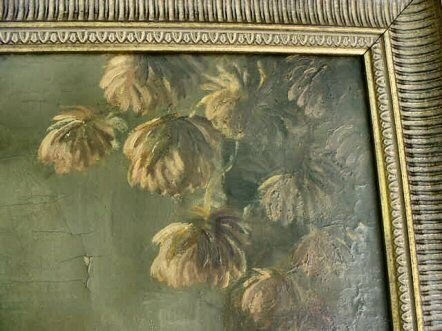 The frame, however, may be an original 1930’s or 1940’s piece. From the general look of it, we have had the rare opportunity to see the German collection at the U.S. Air Force installation Colorado, and the hidden fantastic paintings that were returned to Germany by the U.S. back in the early 1990’s. 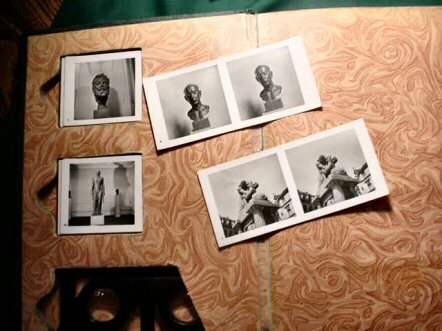 These are stored at a certain German university museum whose name and location cannot presently be disclosed. 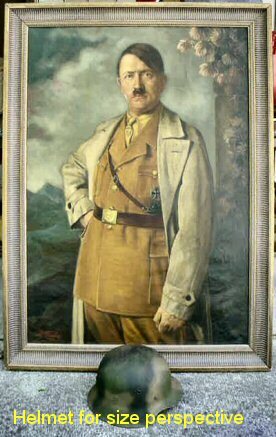 We will say that of all the Führer portraits that are in the depositories none are any better than this masterful work by Herr Fischer. 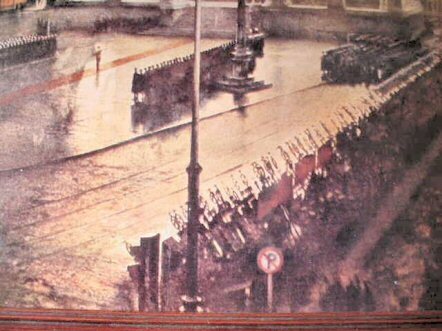 Here is one of the finest art articles of NSDAP history probably ever offered in this country, since the end of World War II. PRICE: TRADED. NO LONGER AVAILABLE. 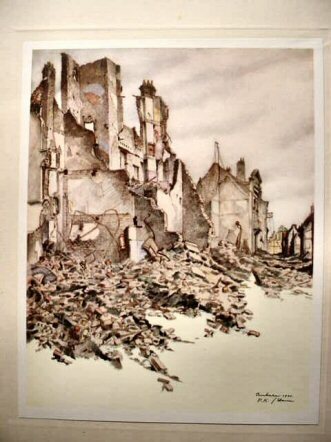 DESCRIPTION:This is a great portfolio of illustrations from the German perspective of the early part of WWII. 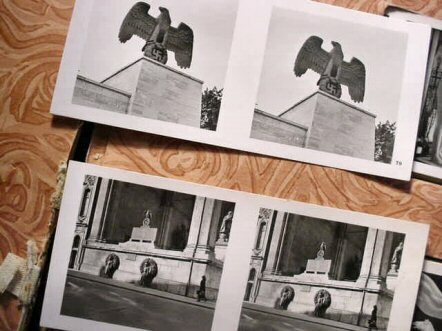 There are 11 13- x 10-inch sheets with 6 ½- x 8 3/4-inch art prints; some in color some in black and white. 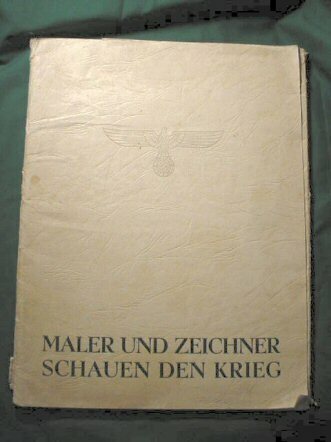 they were assembled and published by the Wehrmacht propaganda company. 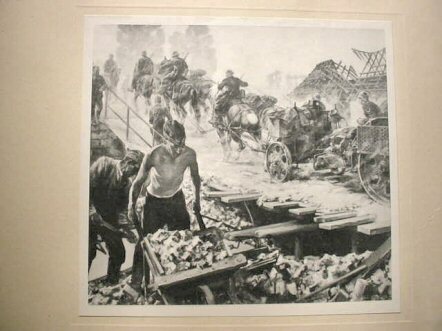 Many are very realistic action perceptions that could only be done by men who actually experienced the front-line life and combat. This is a very fine and historically important archival collection. 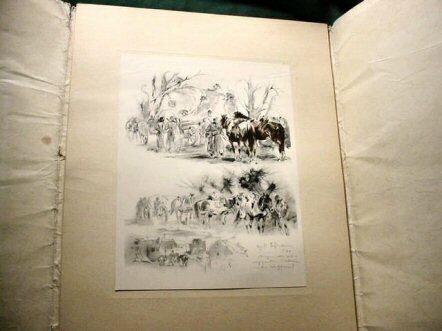 Under the edge of each picture when the corner is lifted one can see a short description of the picture presented. 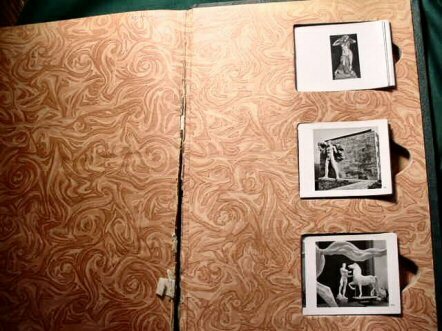 The pictures are all in fine condition. The cover of the folder shows age and use, but is hanging together well, considering its age. In 1942, Henze joined the German Wehrmacht and served as a pilot in the Luftwaffe. 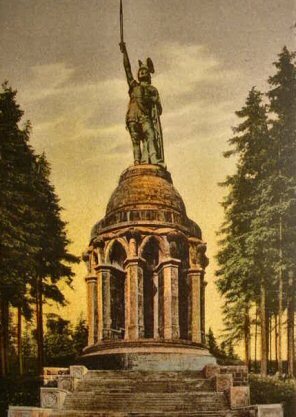 He was captured by the Americans and interned at Bad Reichenhall in Bavaria until 1945 when he was released. 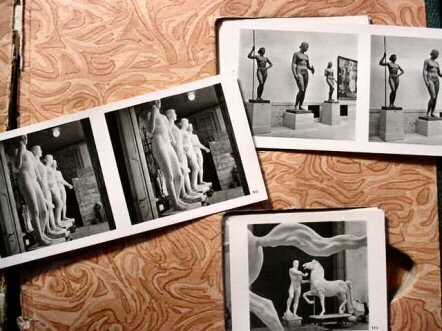 From 1945 to 1950, Henze resumed his art studies in Munich under Profs. Hans Goett and A. Schinnerer. 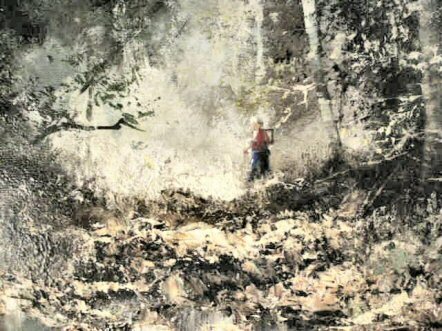 To date, Henze has had 12 semesters of art study and is today working for an art dealer in addition to painting. DESCRIPTION:Why did we know this would get your attention? Are you the complete Germanophile? If so, this will not offend you. This is a beautiful depiction of the 1930’s Nordic lady in naturalistic pose. yes, lipstick and eye shadow was discouraged, but for an artist to portray it, who objected? “Not I,” says the Germanophile. Gorgeous women usually have their way don’t they guys! This is a piece of fine Dresden-style porcelain from the famous firm of Veb Wallendorf Porcelain Factory in the city of Wallendorf. 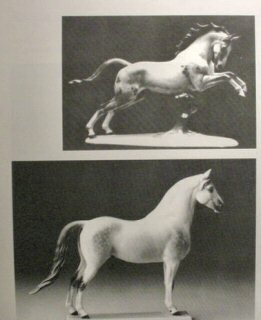 They were the creators of fine bisque figures since 1926, and made such fine art pieces such as this until 1952 or so. 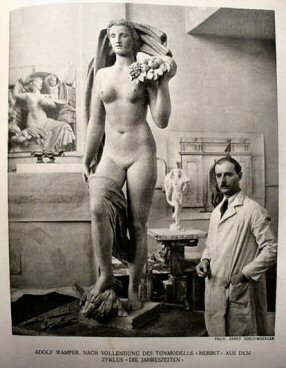 The figure is about 8 ½ inches high and is constructed as only Wallendorf could do it. The girl is in bisque porcelain, while the fabric that she kneels on and covers part of her anatomy with is done in hard-paste porcelain. 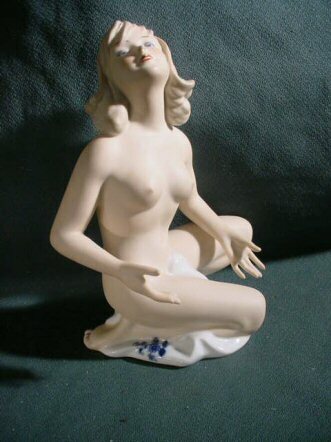 This is seldom seen in porcelain figures of any era. The figure is in incredibly perfect condition. Not even one of the delicate fingers is damaged. 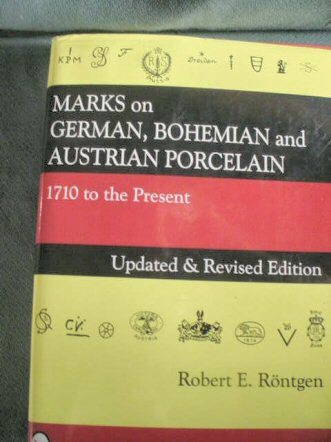 Perhaps not so historically important, but certainly beautiful and Germanic! The figure is in incredibly perfect condition. Not even one of the delicate fingers is damaged. 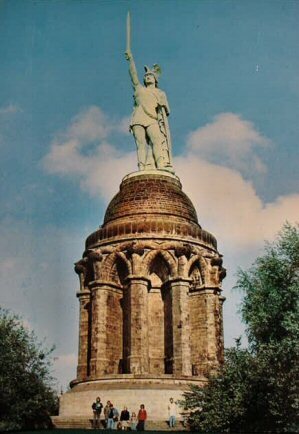 Perhaps not so historically important, but certainly beautiful and Germanic! 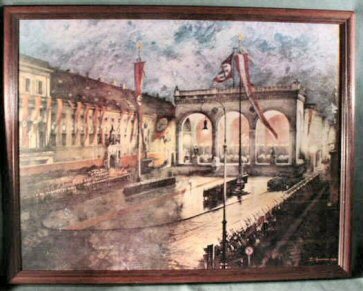 DESCRIPTION: Here is a great color print of the Feldherrenhalle, the most sacred shrine of the Third Reich. 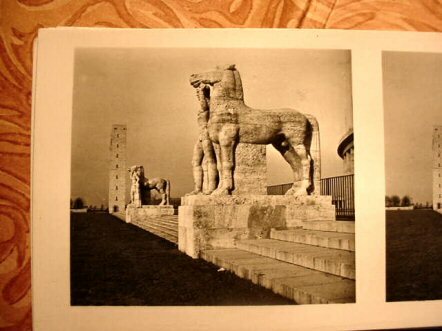 This revered place was the building with its frontal façade with pillars and lions guarding the front steps. This was the hall of the marshals. It sits (or sat) in the Odeonsplatz in Munich. It was the final place where Munichers witnessed the massacre of the NSDAP marchers on November 9, 1923. Fourteen of the insurgents were slain when they met with 100 soldiers and state police. The two groups exchanged fire. Historians believe the government forces fired first. 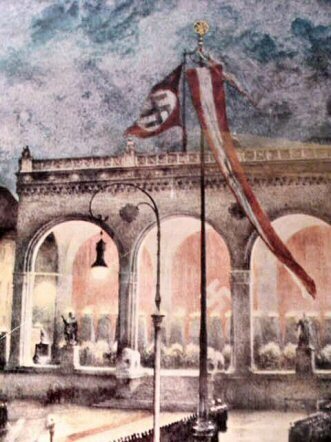 The incident resulted in Hilter’s being convicted and his being incarcerated at Landsberg where he wrote Mein Kampf. At the side of the edifice was an eagle-supported monument. 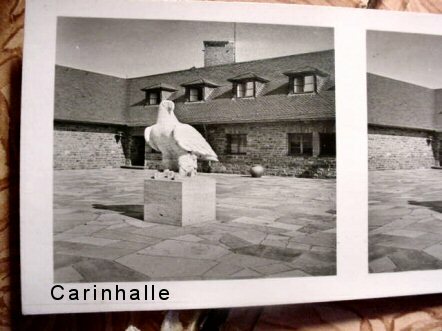 The eagle adorned atop the plaque commemorated the fallen of this Beer Hall Putsch. 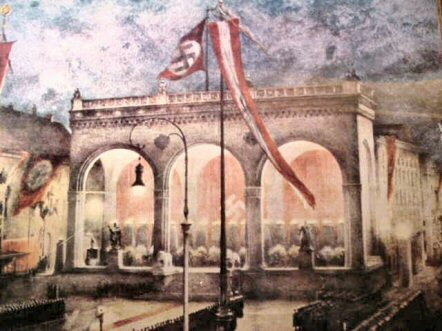 The Feldherrenhalle became a place of extreme reverence to the NSDAP and it was required that one would give the “Heil Hitler” salute when passing the monument at the left side (the Mahnmall). Each November 9th the march was re-created with original participants and at 12:00 midnight new recruits of the SS were sworn in during an elaborate and moving ceremony climaxing with all the assembled SS men singing, “We Gather Together to Receive the Lord’s Blessings.” The picture we offer is a beautiful print of this ceremony. We offer it framed. 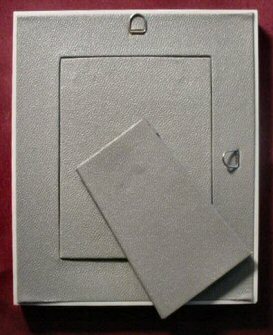 A deluxe frame for one price and there is another price unframed. It measures 23 x 18 inched framed. This is a beautiful mahogany frame just as nice as they come and will be considered a first-class accouterment to any good collection. 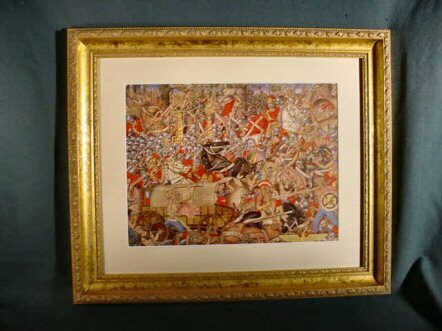 DESCRIPTION: This is a very special painting done in the east Saxon-style; Dunkelkunst. It is dark and cannot readily be seen until a light is put on it. It definitely needs a nice portrait light of the style that attaches to the frame. Once this is done the soft, subtle lines and colors come out magnificently. 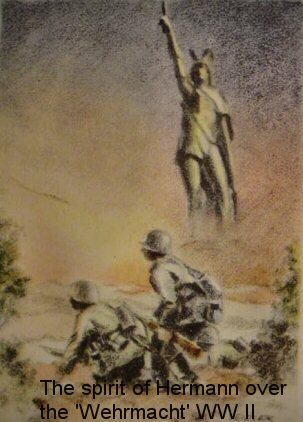 The depiction of one of the hundreds of thousands of Landsers who fought in the fields of glory and later despair. This rendering is truly what we could call a major art accomplishment. 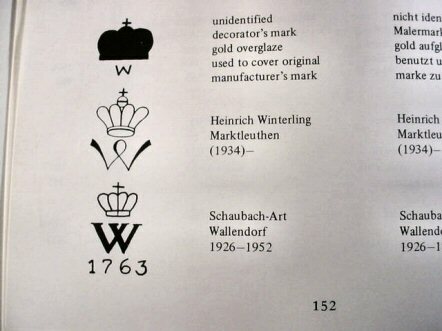 This was a very special art form practiced only it seems in Saxony in the old Kaiser Reich. 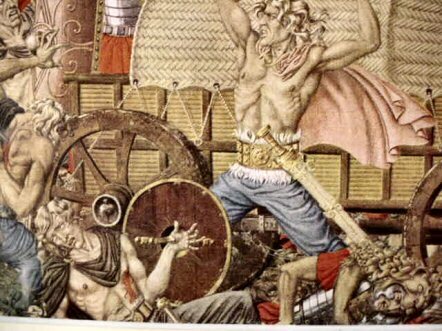 “From darkness suddenly comes light.” The red scarf stood for heroism in that Germanic era. 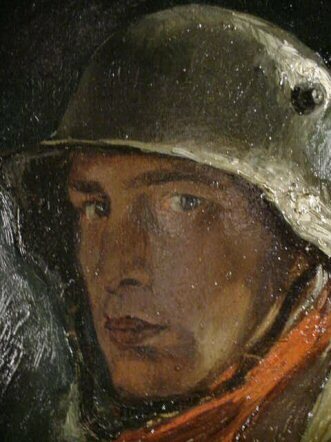 The stern expression in the young man’s face summons up his willing service to König und Vaterland, (King and Fatherland). Deuschland über Alles!. 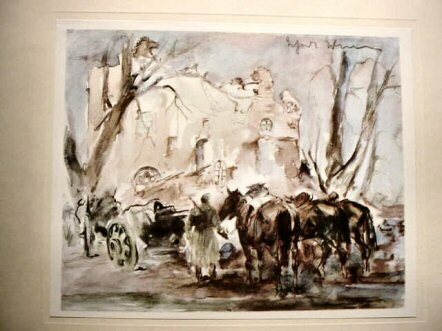 The frame is not original, but would be the style used on such a fine rendering Size in the frame is 24 ½ x 20 inches. 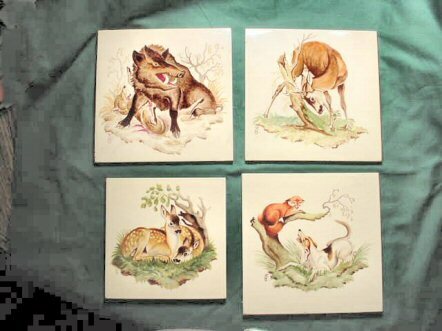 DESCRIPTION: Here is a set of hand-painted tiles by Prof. Theodor Kärner of SS Allach fame. 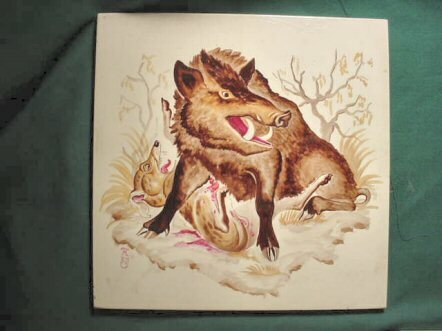 They depict animals of the German Forest: deer, boar, fox, and hunting dogs, one of which has met his grizzly fate. This is a set of four that could be mounted in a very nice collage. These appear to be hand painted by this famous artist and then kiln fired. Three of them are in size 6 x 6, while the one with the two fawns is 5 x 5 inches. 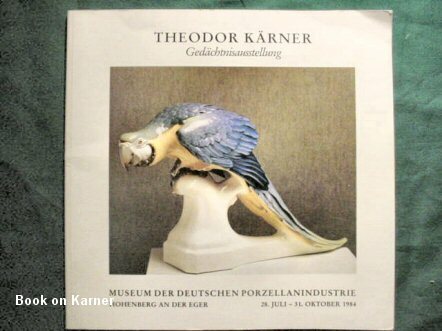 Theodor Kärner was born in 1884, and lived until 1966. 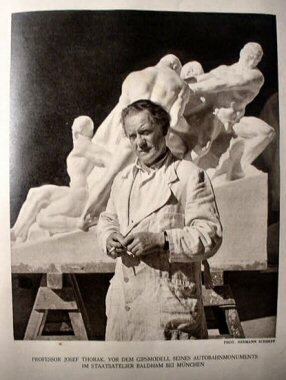 He was one of the best sculptors and workers in porcelain in the entire world. He was also a very accomplished artist in painting. 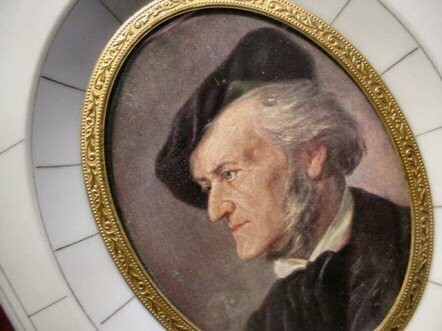 He worked free lance for several companies specializing in fine porcelains: Nymphenburg, Essenback, Rosenthall, and, most notably, Allach, the SS porcelain manufacturer. His works are sought after by collectors worldwide. 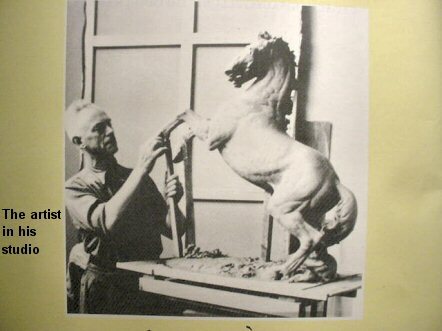 He crafted figures of German wildlife, domestic dogs, horses, birds, and to a smaller degree, people. 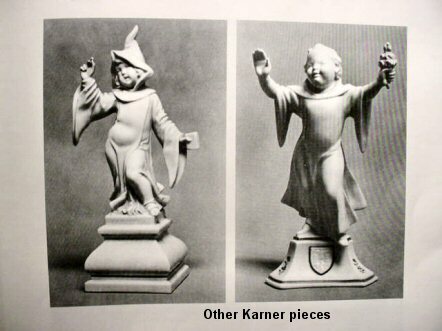 These plaques were an unusual accomplishment for Herr Kärner and probably were done on a special order. 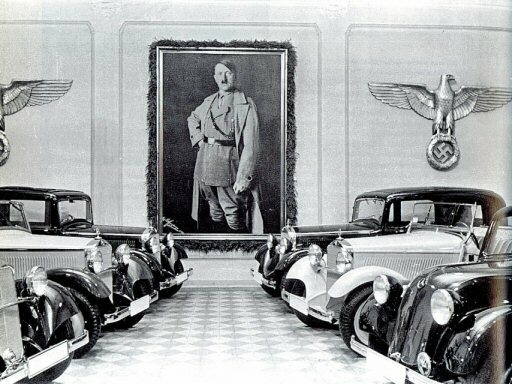 We believe that their particular style is very reminiscent of his style during the Third Reich period. 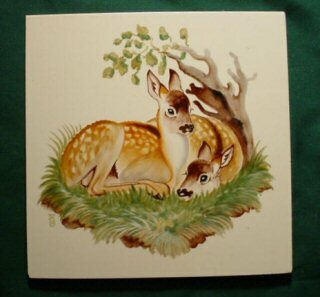 The tiles definitely made in German style were probably produced in Leipzig or Meissen. 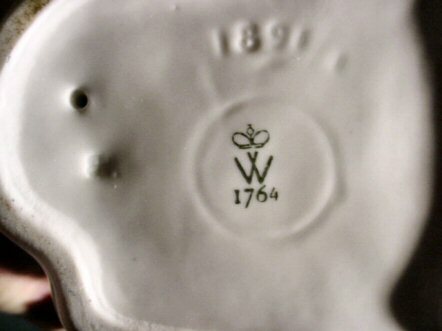 They are marked on the back with a large “M” and “Made in Germany.” This was common on any item from a porcelain company that did a lot of export regardless of whether the item was for domestic use or export. Shown are some of the other articles that Prof. Kärner created over the years. We believe the plaques were made in his private studio and not sold by any of the above-named manufacturers. His “T” superimposed over the “K,” “TK” that is shown over the shield-shaped logo is usually the private-studio item. 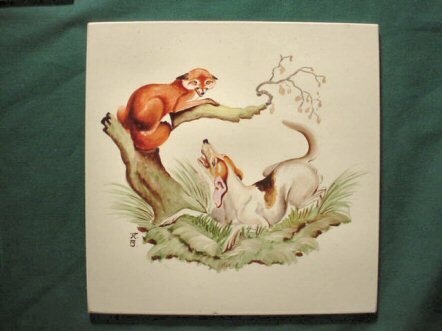 This is an extremely rare set of tiles from one of Europe’s greatest folk artists. 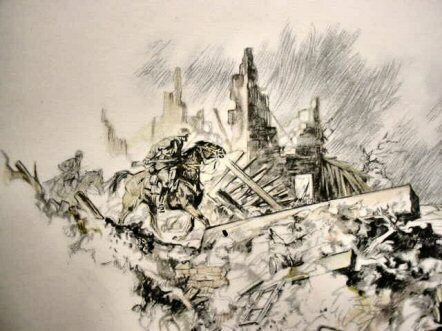 DESCRIPTION: This was originally an Entwurf (design) for a tapestry by the famous Third Reich artist Werner Peiner. 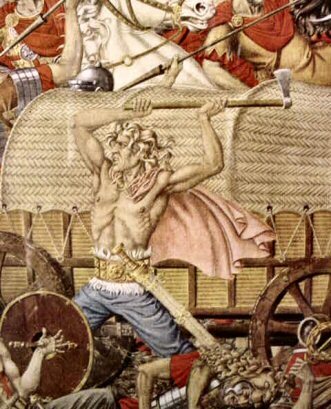 It depicts in dramatic and colorful detail the victorious Germans under Arminius or, as he was called by his people, Hermann der Cherusci. (See our write-up at Beer Steins, Item 1-8.) 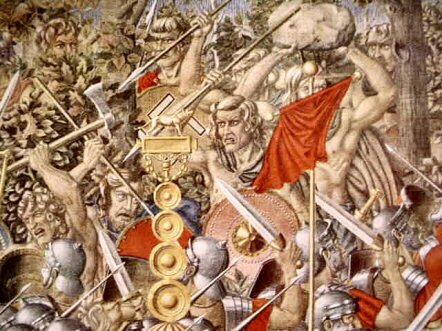 The Germanic warriors fell upon the Roman invaders with a fury unbounded. 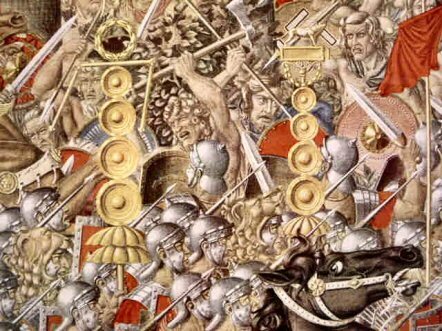 Former tribes, who had warred against each other for centuries, drew together under Hermann’s leadership and soundly defeated the proud legions of Imperial Rome. 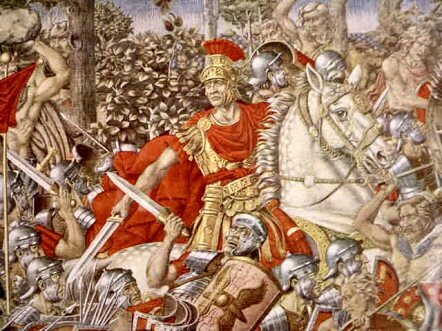 Quintilius Varus, seen at about one o’clock in the portrayal, looks flabbergasted and in complete surprise in the first moments of the battle. The annihilation was complete with no survivors among the legions. The battle changed completely the course of history. 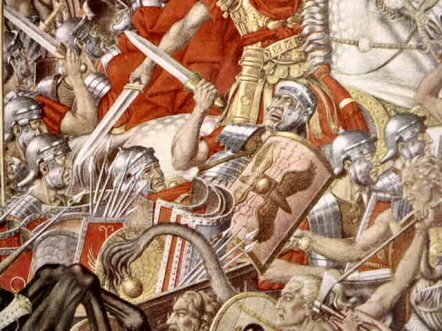 This depiction is only a mid detail of the much larger portrait. 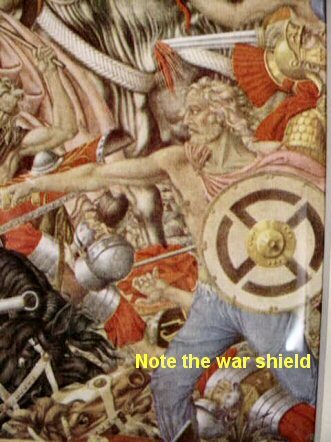 Looking closely one can see the NSDAP motif on various Germanic war shields. 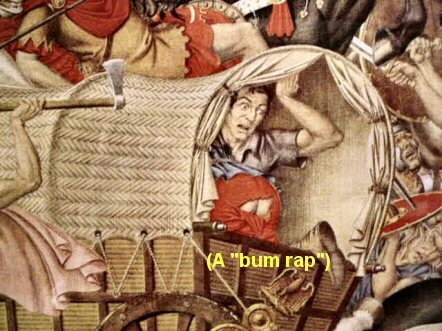 For some rather humorous relief in an otherwise bloody confrontation note the two figures in the covered wagon, especially the posterior of the guy with the red trousers. Peiner was not without humor. This is an absolutely original-period print, not a copy. 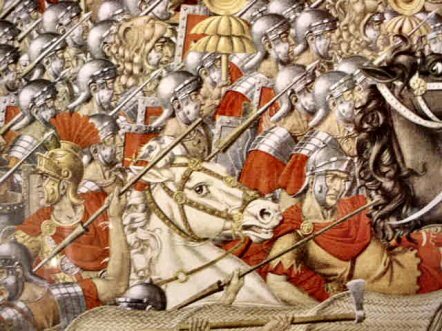 We went to considerable expense to have it specially framed simply because this battle was the world’s most important one and the beautiful depiction by Peiner deserves no less. 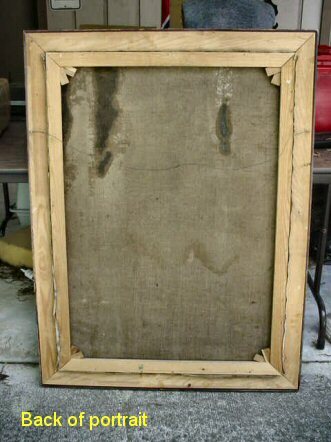 It measures 21 ½ x 18 ½ inches in the frame. The actual picture is 14 x 10 ½. This is truly a thing of beauty and since it is original it is also worthy of preserving.